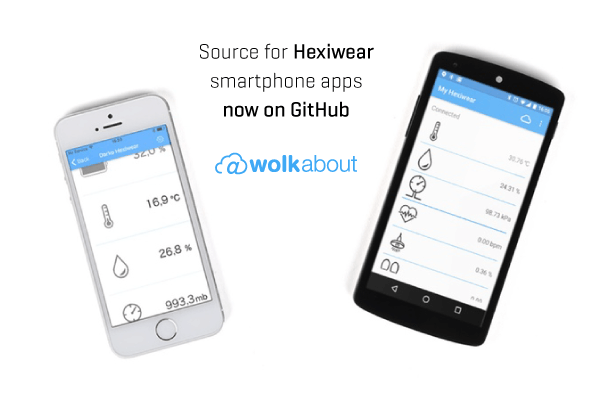 WolkAbout opened up the Hexiwear apps. Hexiwear was always a part of a trinity — the smartphone app and cloud connectivity being the other two pieces. To allow you to create more ambitious projects, WolkSense has now provided the source code for both applications on their GitHub page. You can use the source as a launching point to develop your own custom Hexiwear applications. Focus on a particular functionality, or just hack the interface to better fit with your taste. Use it with your favorite Android/iOS development environment. If you need to alter the firmware on the Hexiwear unit to fit your vision, you can get the source for that too, on our own GitHub channel. See the recording of the Writing your first program Hexiwear webinar to see how to get and set up all the tools you need. The webinar will be available in written form soon, for those who find it easier to follow that way. If you are thinking more in lines of commercially viable projects, then you should head to HWTrek, where a Hexiwear program is under way. Consultations with NXP are part of the offer.